The Shahnameh is a 50,000 line epic poem, written by Iranian poet Ferdowsi in the 10th Century to convey a sweeping legendary history of Iran from the dawn of time to the 7th Century. Dazzling performance storyteller Xanthe Gresham-Knight and Arash Moradi, the eldest son of Iran’s leading tanbour master, bring energy, humour and a lightness of touch to the adventures of Rustam, the ultimate heroic warrior; capable of winning any war but, ultimately, on a quest for peace. 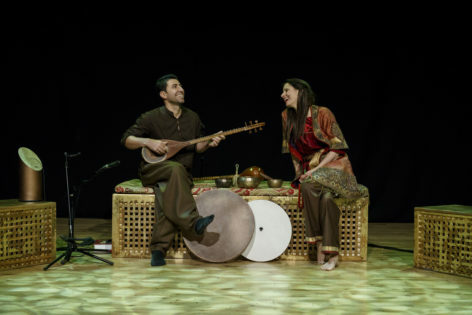 Audiences follow interweaving narrative threads across several generations, from tales of the magical Simorgh, to the tragedy of Rustam and Sohrab, travelling through the mountains, gardens and fountains of Persian mythology.